Former Sunderland midfielder Daniel Wright has signed for South Shields. Ambitious neighbours South Shields and Hebburn Town go head-to-head tonight as they continue their preparations for the new season, writes Daniel Prince. The South Tyneside derby is taking place at Mariners Park, with kick-off at 7.30pm. The game will see a number of Hebburn players come up against their former club, with Louis Storey, Graeme Armstrong and Luke Sullivan having all made the move across the borough this summer. Former Mariners midfielder Andrew Stephenson also linked up with the Hornets during the off-season. Shields will be able to call upon the services of former Sunderland midfielder Daniel Wright, who completed a move to the club yesterday. The 20-year-old enjoyed a short spell on loan with his hometown club last season and has now put pen to paper with the Mariners after leaving Sunderland. 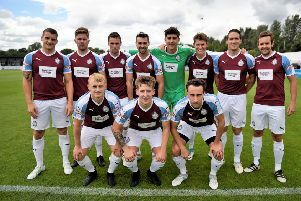 The former England youth international impressed in Saturday’s friendly against Blyth Spartans at Mariners Park, when he was listed as a trialist. He said: “I’m buzzing to have signed and can’t wait to get started. “I’ve loved pre-season so far. “The training has been excellent and you can see what the managers are trying to get out of the players. “The way they want us to play has really caught my eye. “I got to know the lads really well last season, and my experience here the last time was one of the reasons I wanted to join. Wright has represented England’s Under-16s, Under-17s and Under-18s. 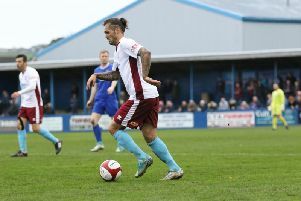 He made four appearances for Shields after joining on a youth loan from Sunderland in January, before an ankle injury cut his season short. Joint manager Graham Fenton said: “We’re absolutely delighted to have secured the signing of Dan. “As soon as we knew he was available, we wanted to get the deal over the line as quickly as possible. “His performance on Saturday just reiterated what we already knew about him. “He admitted himself he kind of ran out of steam in the second half, so as with all of the players at this time of year, he probably needs to do a little bit of fitness work. “With his attitude, we know he’ll get as fit as we need him to be. Admission to tonight’s game at the turnstiles is £6 for adults, £4 for students and over-65s, and £2 for under-16s.